Turn your trusty cellular companion into the subject of a scavenger hunt between you and your friends. Your smartphone already sits on the table while you're out to brunch, it lays next to you on the couch while you watch reruns and scroll through texts--you might as well give it the official party invite. Game of Phones turns your trusty cellular companion into the subject of a scavenger hunt between you and your friends. Just gather your friends and their smart phones (sorry, flip phone, you're not invited), draw a prompt card, and see who can use their phones the fastest to create an emoji masterpiece, show off the last photo you took, or find the weirdest Google Image result for your name. Collect the most points to win. Only the fastest and funniest will survive. To keep the fun going, try one of the expansion packs featuring 30 new cards each to add to the original deck. Made in China. Materialism Expansion Pack is exclusive to UncommonGoods. 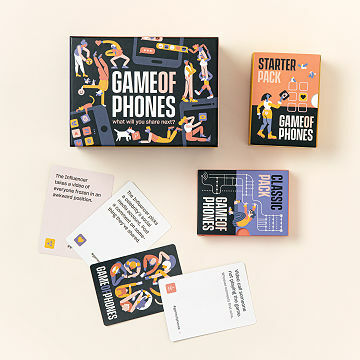 Game of Phones deck includes 100 cards. Each expansion pack contains 30 cards which can be added to the original deck. I thought I would pick this up to play with friends since we like to play games whenever we get together. The experience was meh; unfortunately it didn't live-up to expectations, and can get rather repetitive. What fun! Great gift for millennials! These days nearly everyone is on their smart phones... young and old. This was a fun way that they could still do that, but interact with each other in a super fun way! From Santa for my four girls. We spent hours laughing and playing. Wonderful family time. Perfect to cover either half of a large or small avocado! The game lets my niece have fun with her phone while being "present" with people she plays with. Fun to see her not staring into her phone by herself.